The man who practically owned the western neighborhoods. You can read this page in Bulgarian or Polish if you want. Born in Aachen, Prussia, Sutro joined California's Gold Rush in 1850, ready to make a fortune with his education in engineering. He engaged in trading goods for a number of years, and eventually followed the hoards to the great Comstock silver strike in Nevada. He started his own mill to process ores, but his grand scheme was the boring of an enormous tunnel to solve the Comstock mines' ventilation, drainage and safety problems. He tirelessly petitioned for funding from the government, from banks, from the great monied interests on the eastern seaboard. Almost single-handedly and in direct opposition to the powerful political machine of the Bank of California and the very mines his project purported to aid, Sutro got his tunnel built. Sutro's plans to profit from the sale of land around the tunnel and the cornering of various industries and businesses important to the tunnel's operation mostly fell flat. In fact, the tunnel's actual usefulness to the mines is in question to this day, but Sutro got out at the right time. In 1880 he quietly sold all of his stock in the Sutro Tunnel for a great sum before the enterprise became practically worthless as an investment. With his tunnel money in pocket, Sutro bought thousands of acres of land in San Francisco. 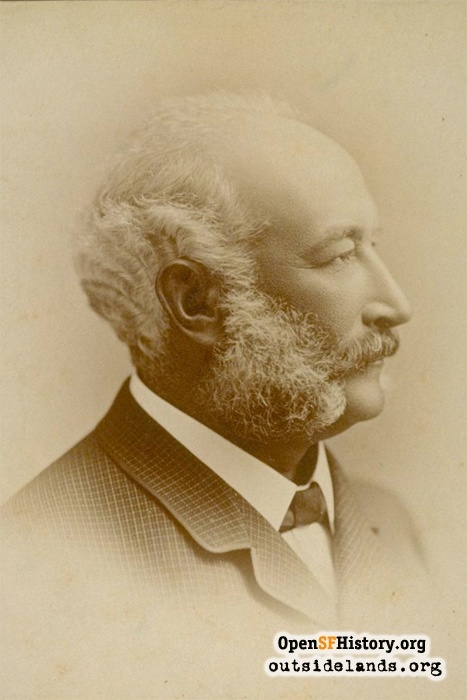 From Samuel Tetlow he bought a cottage on a bluff overlooking the Pacific for his private estate. He steadily added land all around it and took over much of the old Rancho San Miguel to the southeast. Unlike many other rich men, Sutro strove to share his good fortune with the public. He purchased the generally disreputable Cliff House below his residence and gardens, remodeled the structure into a fairy tale Victorian castle, and turned it into a respectable destination for families. In the early 1890s Sutro spent over a million dollars to build an amazing complex of public baths next to his Cliff House. Sutro Baths' enormous swimming pools, filled with pumped-in ocean water and heated to different temperatures, were accessed by slides, ladders, and flying rings. Stuffed animals, totem poles, armory of all types, coin collections, and even Egyptian mummies littered the hallways for the edification of the public. Adolph believed the Southern Pacific's ten-cent streetcar fare over the seven miles to his oceanside park was excessive. In typical bullheaded fashion he fought back by building his own railroad line and charging half as much. 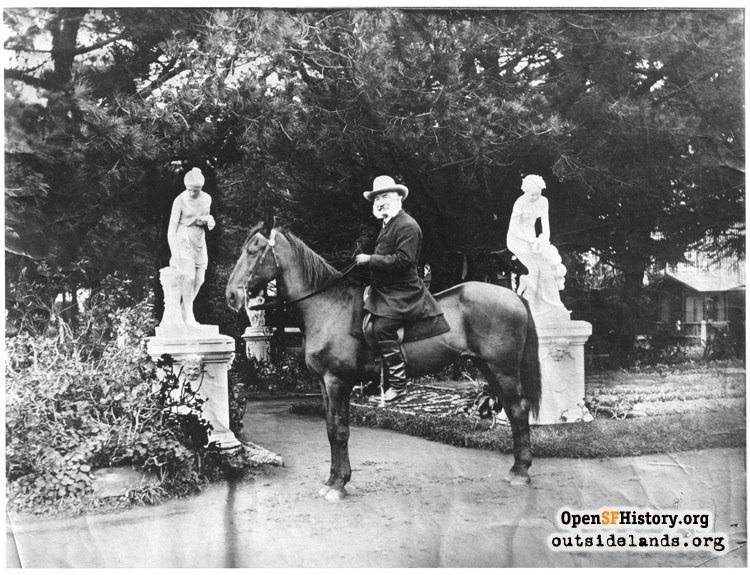 At his estate on the bluff anyone was welcome to stroll his elaborate gardens, embellished with statuary, gazebos, topiary and dazzling carpet-bed designs. There Sutro played host to presidents, writers, dancers and celebrities of the day. Everyone from Oscar Wilde to President Benjamin Harrison breakfasted with Sutro among the classical statues of his parapet high above Seal Rocks and the sea. Sutro's popular ways turned into a term as the city's mayor from 1894-1896, (again in opposition to the powerful political might of the Southern Pacific). His tenure was mostly unsuccessful as Adolph found his lay-down-the-law demeanor bogged down in government's checks and balances. Devoid of significant political connections with the city's supervisors and determined not to build any, Sutro worried and bemoaned his way through his term before retreating to his estate. Adolph Sutro's goodwill was evidenced again and again in the years before his death. 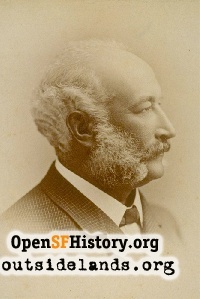 He donated the land to found the present day University of California-San Francisco. He sponsored Arbor Day plantings to create Sutro Forest. He amassed one of the largest private libraries and donated it for public use. (Visit the Sutro Library's present home next door to San Francisco State University.) He sponsored numerous events for the children of the city to learn and play. When this San Francisco giant died on August 8, 1898 the city didn't really appreciate what they lost. His children had a quiet funeral, the newspapers focused on the various minor scandals, and his gifts to the city lay mostly unappreciated for decades. Soon after his death, Sutro's heirs challenged his will and began a years-long struggle to break the land trust he created and gain title to his vast holdings. A successful verdict allowed the heirs to sell the lands West of Twin Peaks. The neighborhoods created from these deals include Forest Hill, West Portal, St Francis Wood and Westwood Park. Do you have some connection to the western neighborhoods? Contact us to arrange an interview, and save those memories for posterity!